Gramma Lulu’s Potato Salad | eat. cook. blog. As mentioned in my “About” page, Gramma Lulu was my first cooking inspiration. Among other things (like baking dozens & dozens of cookies and pies at Thanksgiving), she was the cook for all my grandpa’s Moose and Elk Lodge events. She’d take my siblings and me down to the lodge, we’d drink Shirley Temples and watch her in the kitchen, making massive amounts of baked beans, fried chicken and potato salad. 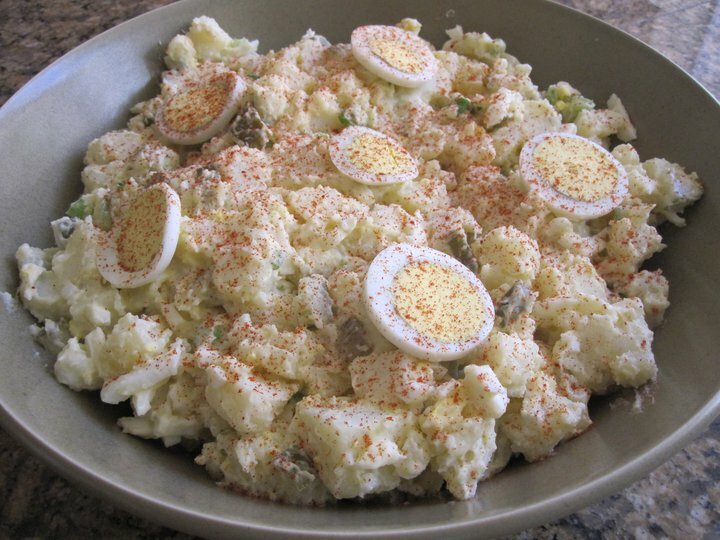 Ahhhhhh…the potato salad. My husband Tony says that’s the reason he married me. Gramma Lulu’s potato salad. When Tony and I married nearly 28 years ago (almost exactly, to the date, really, on August 19), my mom and grandma “catered” the reception, which included, of course, vats of potato salad. Tony still bugs me to make it all the time. I don’t do it nearly often enough. And I don’t think the recipe has been written down until now. In a covered saucepan cook potatoes in boiling water for 20 to 25 minutes or till just tender; drain well, Cool, peel and cube potatoes. In a very large bowl combine potatoes, the 5 chopped eggs, pickles, green onion, Miracle Whip, dill, seasoned salt and pepper. Toss lightly to mix. Smooth the top a bit and garnish with the sliced egg. Sprinkle with a little paprika. Cover and chill at least four hours (the longer the better…can be made the day before). And then bring some over for Tony.